The splats survived the dual purpose shaving too and the chair shows signs of being a success. 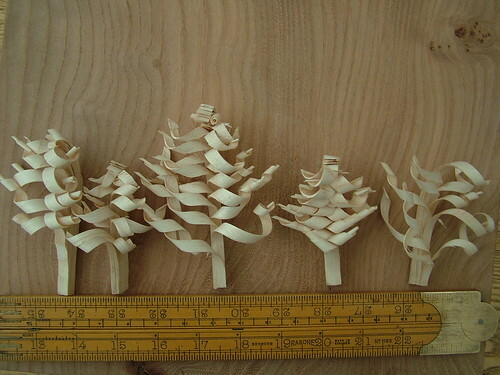 The little trees’ branches are quite sturdy as the wood is dry ash, must be a Christmas decoration in the making here. 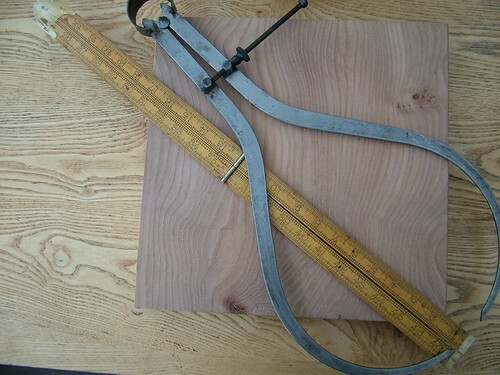 I was expecting some callipers about 1/3rd that size, the photo on eBay had no scale, and I just assumed it would be about the size of the one I have been using until the thread stripped on the adjuster nut. Well I suppose it’ll do the same job, and it’ll go with the large 4 foot (count ’em!) folding rule that came last Friday to replace the two foot which I managed to break at the hinge (leaving the rule out forgotten one night under the lathe must have made it stiff).